To be a Made in New York company, at least 75 percent of one's development operations must be based in the city. That applies to Makerbot, which today unveiled its brand new 50,000-square foot factory located in a previously empty facility in Sunset Park, Brooklyn. Calling the space a "factory that makes small factories," Makerbot CEO and founder Bre Pettis proudly declared that, "Brooklyn is just the best place in the world." Rachel Haot, New York City's Chief Digital Officer, gushed that New York is the number one place for 3D printing in the world. Borough President Marty Markowitz joked that while he does have 8,000 Facebook likes, he also has 7,000 "oy veys" and 6,000 "fuhgetaboutits." Makerbot, it was made clear, is very much a Brooklyn company. That is, unless the company sells itself. Earlier this week, the Wall St. Journal reported that Makerbot had engaged in talks with strategic investors as it was raising its next round of funding. Thus far the company has only raised $10 million in VC funding (from True Ventures, Foundry Group, RRE Ventures, Bezos Expeditions and Sam Lessin). By contrast, Shapeways, another 3D printing company based in New York, recently raised $30 million in funds from Andreessen Horowitz, Union Square Ventures, Index Ventures and Lux Capital. However, rumors that the sale talks had fallen apart began circulating in recent weeks. According to a source familiar with the situation, Makerbot's initial fundraising conversations were put on hold when the strategic offer came in, but the company has re-engaged in fundraising talks in recent weeks. Investors weren't told who the strategic buyer was, but some speculated it could be a maker of 2D printers like HP. The deal value was initially pitted at around $400 million ("give or take $100 million"). The Journal report included a $300 million valuation for the company. The rumors served as a slightly awkward undertone to an otherwise celebratory event in the industrial neighborhood of Sunset Park, Brooklyn, today. Pettis's genuinely infectious enthusiasm is reflected in the company he built -- the 100 Makerbot employees at the factory, ranging from engineers to assembly line workers, beamed and cheered at the event's many Brooklyn shout-outs. Many of the employees I spoke with had little in the way of relevant technical experience before joining Makerbot; they were tinkerers who were drawn to the company out of the love of making cool stuff. One employee dubbed the ragtag crew as a lot of "general novices." Pettis explained to the crowd that the factory opening is another step towards catching up to the growing demand for retail 3D printers. Makerbot has struggled to meet demand since it immediately sold out of the first batch of 20 machines it put on sale in 2009. It had $10 million in revenue last year and expects $50 million this year, the Journal reported. While plenty of community goodwill was created with Makerbot's decision to keep manufacturing in the US, Pettis also made a strong business argument for his choice: Makerbot is iterating so fast that it doesn't have time to go back and forth with overseas manufacturers over tweaks, updates and changes. Secondly, the cost of labor is actually rising in parts of Asia. Third, fuel prices are making overseas shipping of product prohibitively expensive as well. Lastly, he said, there is a noticeable pride in the work that his Brooklyn employees put into each machine. The machines each say "Made in Brooklyn with pride," and it is true. One "can't estimate the value" of this, Pettis said. "By manufacturing here, we really make better products," he said. Then came the audience Q&A. 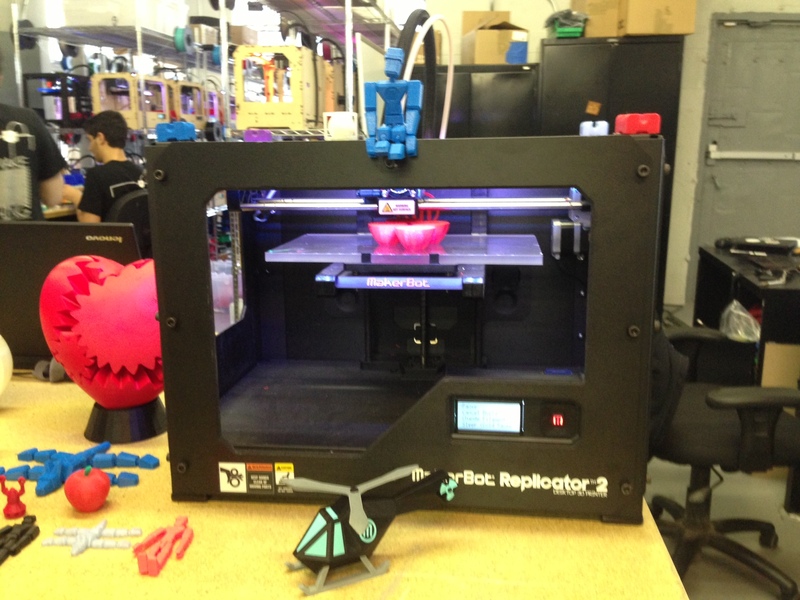 The first question: Is Brooklyn-based Makerbot about to sell out? Pettis politely declined to comment, and everyone went back to being impressed with our surroundings. We toured the facility and played with plastic toys, printed from machines made by a company operating independently from Brooklyn, that is, for now.